Agree with people when they point out their own weaknesses. 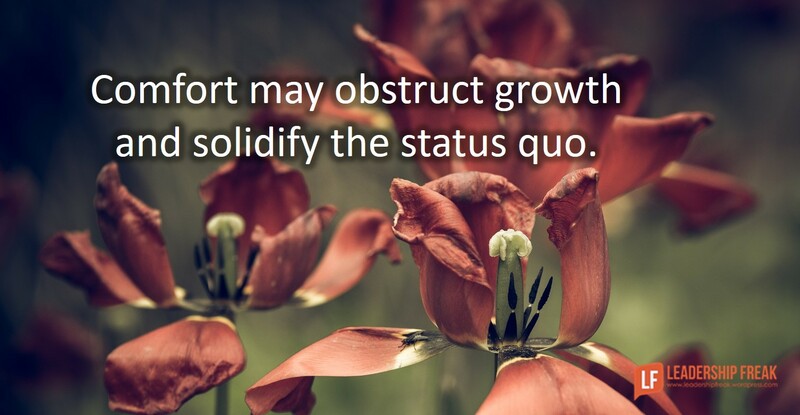 Comfort may obstruct growth and solidify the status quo. If you weren’t critical who would you be? If you were decisive, what would be true of you? If you connected with others better, what would you be doing? When a team member says, “I’m too critical,” give an affirmation and ask a question. Growth requires honest, sometimes awkward reflection, not superficial answers. How might leaders turn the self-criticism of others into tipping points for growth? Brilliant! When someone is being self-critical we should view it as a request for help. They are looking to grow. They are essentially saying “I think I need help with this”. When people downplay someone’s challenges, they often do so because they think they are being nice. But is it nice to delude someone? Is it nice to let someone continue engaging in behaviours that aren’t helpful to them and others? Self-criticism can be a powerful door opener to personal growth. So walk in. You might be surprised what you find there. Alf…you are spot on. As one who can be self critical, that’s essentially the cover…when I’m that way, I’m lacking the confidence I should have and giving in to the voices of assessments that really aren’t grounded. I don’t think generalized self-criticism (I’m too critical or I’m not decisive.) is the way to go. I think it is very important to help the person be more precise and specific. “I am not decisive.” In what situation are you not decisive? In what situations are you decisive? What are the differences in each situation? Is your indeciveness in those situations due to a lack of ability or motivation? When a person make broard, general statements, you need to help the person peel back the onion and identify the underlying issue. It’s hard for anyone to make changes before framing the precise problem. I suggest that you could also start a discussion about what is BEHIND that issue, focusing on the strengths of it. Being too critical means what, actually? That the person has high standards that are not being met with other people’s performance or that they have higher expectations of their own performance results that are not being matched? Similarly for “decisiveness” – is the person generating too many options or perspectives? Are they playing devil’s advocate and taking the opposite view to be safer? What is the strength that they ARE using as it reflects as some weakness. It could be a much more useful kind of performance enhancement conversation, it could be much more motivational and reflection on one’s behaviors is always useful. I wonder if there’s also value in asking them why they want to change that aspect of themselves. Sometimes I think people can fall into a trap of criticizing themselves because they’re looking for someone to make them feel better, not because they actually believe that they need to (or can) change. If that’s the case, I wonder what approach would be most helpful to them. Any ideas?